P. Cayce Powell joined Thompson & Associates in 1999 with an M.B.A. and J.D. from Texas Tech University. He now serves as President, working from the national headquarters in Nashville. I’ve met a lot of extraordinarily generous givers over the years, many of whom have made a long-lasting impression on me. There was one couple, however, that I’ve never been able to forget—but, not because of the amount they gave. In terms of big-dollar philanthropy, this was not one of those seven- or eight-figure endowments, but it was one that will make a big difference. What made the deep impression on me was witnessing the pure elation from someone whose desire and felt-need to give was suddenly enabled. It just took a little out-of-the-box creativity and a discussion about beneficiary designations to make it happen. Many years ago, Eddie Thompson and I were contracted by a foundation representing a large number of churches. The foundation wanted us to provide some basic estate planning for church members and particularly for those with the desire and capacity to financially support their local churches. Once a month we would go to a different city where Eddie would conduct a Saturday seminar that typically worked through the topics of money management, stewardship, and, finally, estate planning. For church members wanting to follow up with us, we provided a values-based questionnaire and financial worksheets designed to help them take inventory of their current assets. As an attorney with Thompson & Associates focusing on estate-planning and charitable giving, my part of the program began in the following week with scheduled appointments. We would spend part of our time talking about their desires from the values questionnaire, their financial goals and obligations, and the ideal distribution of their accumulated assets—how much to their kids, how much to the government, and how much to charity. Back in those days, however, we really didn’t have time to borough into complex estate-planning strategies, and it was beyond the scope of the services offered by the sponsoring foundation. So, the one-hour scheduled meetings had to be very focused. We met with a lot of great people over the several years we worked with that foundation. We were genuinely inspired to hear them talk about their values and their commitments to support their local church, community, and other organizations. There was one couple who had been supporters of denominational missionaries for many years and (as I recall) had a personal connection with some of those missionaries serving abroad. The couple had given what they felt they could and probably more than most. However, there was always a lingering regret that they could not do more, along with the inner feeling that they were supposed to make a very significant donation. Their dream had been to give ten percent of their estate to missions. However, there were significant and persistent hesitations. They were faithful but very conservative donors, and like most parents, abhorred the idea of ever becoming a financial burden to their children. That same sense of obligation and responsibility had loomed over every significant giving decision they had ever considered. You could say they had a case of “philanthropic paralysis”—stuck between the sincere desire to give and the fear of an unknown future. I proposed a plan that would enable their unfulfilled desires to give generously. Together we began working through the possibility of bequeathing a portion of the assets in their Individual Retirement Account (IRA) to the organization to which they had been connected. When the wife realized that they could initiate a future gift from their IRA that would equal ten percent of their estate, tears began to well up in her eyes. When she realized that future gift could be almost $100,000, she broke down and began to cry. It was as if there had been a great expression of generosity that had been pent up trying to get out for many years. All fundraisers know that using Individual Retirement Accounts for charitable giving is for many donors an efficient giving strategy. As future gifts, they are perhaps the easiest to secure, especially for donors who really want to make a difference. And so, it’s quite surprising that some fundraisers rarely make those kinds of appeals. Below are a few reminders about the benefits of giving from IRAs. 1. A revocable gift from an IRA is simple and low risk. It is simple because donors can set up a gift of any amount by filling out a one-page Beneficiary Designation Form. They don’t have to go to the expense of hiring an attorney to rewrite a will, because funds remaining in IRAs transfer to beneficiaries outside of probate—an important thing for fundraisers to understand. It’s a low-risk giving decision because the beneficiary designation is revocable. If unexpected financial circumstances demand it, the designated amount can be changed or revoked. The simple and low-risk aspects of future-gift designations from retirement accounts make them appealing to donors wanting to give. a) All distributions (withdrawals) from Individual Retirement Accounts are taxed as “ordinary income,” the highest tax rate. The 2018 tax rates on ordinary income can range from 10% to 37%, depending on your tax bracket. So a $10,000 withdrawal from an IRA could potentially create a $3,700 tax liability, plus a penalty for an early withdrawal. b) Distributions from an IRA are counted as ordinary income even if those accounts are inherited by their children as part of an estate. c) For retirees over the age of 70½, lifetime gifts to charity from IRAs are counted toward their Required Minimum Distribution (RMD). The amount “forced out” as a RMD not only creates ordinary-income tax liability, there is a stiff penalty for failing to make those withdrawals: 50% of the Required Minimum Distribution. Common advice for retired individuals over 70½ is to do your giving from your IRA. 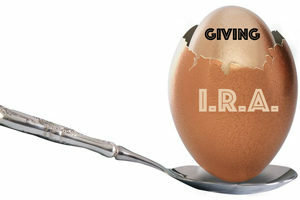 Because giving from an IRA is so simple and tax-efficient, individuals should first consider making their charitable gifts from their IRA both during life (for those over 70 ½) and from their estate. a) The designation was for a percentage (not a fixed amount) of the remainder of the IRA upon the death of the surviving spouse. Rarely are Individual Retirement Accounts exhausted. Because of the tax liabilities, IRA disbursements are typically taken as a last resort. b) They already had a strong connection with the designated organization. c) They were long-time members of the local church where the organizational mission was reinforced weekly. d) Most importantly, they had already expressed the desire to make a significant gift. They just needed to figure out (given their circumstances) how to make it happen. Finding creative and risk-appropriate ways for potential donors to make significant contributions was the goal of our efforts on behalf of the foundation. It is, in fact, the goal of every fundraiser. Nonprofit fund-development departments often solicit funds with blinders—like the blinders that force horses to see only the path directly in front of them. There are, however, many effective ways that donors can contribute. Witnessing that couple’s pure sense of elation over the opportunity to give made a deep impression on me—one that has stuck with me all these years.